Bidding in a Priceline hotel auction is one of the most interesting ways to score cheap hotel rooms. It takes research, practice and patience to get these deals, but it can be really satisfying in the end. I’ve seen people get really ridiculous deals this way — often a fraction of the prices displayed on other hotel booking sites. What is online hotel bidding? You specify your travel dates, a preferred neighborhood and your minimum hotel star rating, then name a nightly rate you’re willing to pay. Below are some screenshots from Priceline. You review your bid and enter your credit card details. If there’s a match, Priceline books the hotel and charges your credit card immediately. If there’s no match, you can make another bid after either waiting for 24 hours or making significant changes to your hotel criteria. If Priceline doesn’t accept your bid, you’ll be prompted to add more areas, lower your star level, change your travel dates or increase your offer price. It sounds simple enough, but there are some pretty complex strategies to learn if you really want to get the best hotel deals through Priceline hotel bidding. 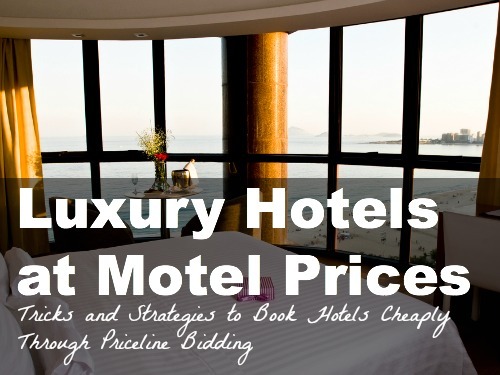 Is Priceline hotel bidding for you? 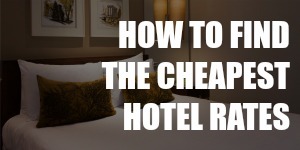 Even though you can book hotel rooms cheaply this way, it’s not for everyone. Deep discounts on hotel rooms. It could save time because you won’t discover the hotel name until after you’ve confirmed the booking. This means you won’t go through every single review on TripAdvisor before making a decision. You have to spent some time and effort on research every time you bid on hotels. After all, you want to save money and not just get any bid accepted. You won’t pay the amount you bid. There are fees and taxes on top of the nightly rate, so factor them in when you determine how much to bid. You’ll see the total amount before you make the payment. Many unknown variables. You can choose a neighborhood, but you don’t know whether the mall is just around the corner or a 20-minute walk. You can also choose a star rating, but even that is rather arbitrary as one hotel could have different star ratings across several booking websites. You also can’t tell whether the room is non-smoking and whether there’s one queen-sized bed or two twin beds. If it’s a long trip, it will be especially difficult for you to get a match. Some hotels may only have the discounted rooms for three nights, for example. So if you want to book a long stay on Priceline, you may have to split it into multiple bookings, with the risk that you’ll have to change hotels halfway into the trip. You can’t earn hotel loyalty points. The booking is non-refundable, non-cancellable and non-transferable. 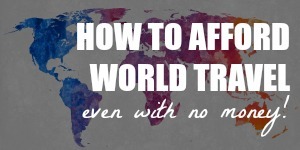 If you can’t be bothered to do hotel auctions, there are other ways for you to get great deals on hotels. If bidding on hotel rooms still sounds like a good idea, check out some bidding strategies below. It would be really easy to get deals on Priceline if only you can start at, say, $50, then increase your bid by $5 each time until you get a hit. But since you can only bid once every 24 hours, you could spend days or weeks just slowly increasing your bid. Fortunately, there are some tricks you can use to bid multiple times a day and I’ll go through them in a minute. One universal tip before you start bidding: Sometimes Priceline would tell you that your bid is too low, but if you bid $X, you should get a match. This means that your last bid was close to the lowest amount they would take. Don’t bid $X because you can usually get the room for less than that. Instead, bid halfway between your last bid and $X. 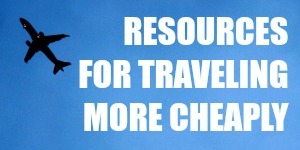 If you’ll be traveling with someone, you can both make bids and double your daily bid limit. This person has to be an adult who will travel with you because the winning bidder has to provide his or her photo ID and credit card at check-in time. You are allowed to make as many bids as you want, as long as you change at least one of your criteria: dates, area or star rating. To take advantage of this, start with a bid for your one ideal area and your highest star rating. Then, add another area and/or lower half a star rating until you get a match. Just be sure you won’t mind staying at any of the additional neighborhoods and/or lower-rated hotels. This method can potentially give you more than 100 bids a day. 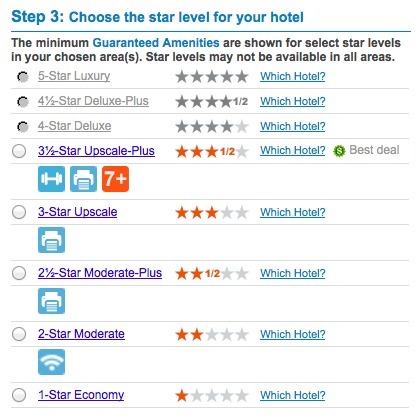 It’s based on this one fact: Priceline can offer you a hotel with a higher star rating than you specify, but not lower. Start by identifying safe rebid zones. A safe rebid zone is one where all the hotels available are lower than your specified star rating. Let’s say I want a four-star hotel room in downtown Seattle. 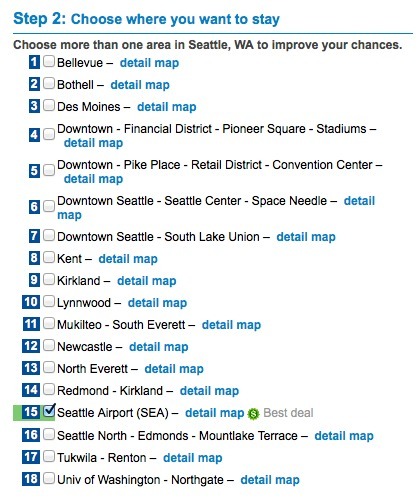 In my example below, I choose one random zone (Seattle Airport) and Priceline tells me that they only have hotels rated 3.5 stars and below there. Remember that I actually want a four-star hotel in downtown Seattle. This random zone (Seattle Airport) would be a safe rebid zone for me because there are no four-star hotels there that Priceline can assign to me. Once you’ve identified all your safe rebid zones, bid a combination of your target zones and safe rebid zones. Priceline will only try to match you with hotels in your actual target zones because there are no matching hotels in the safe rebid zones. In my example, if I were to tick the downtown zones and the safe Seattle Airport zone, then choose a four-star rating, Priceline can only match me with four-star hotels in downtown Seattle. As you can see, the more safe rebid zones you can identify, the more bids you can place per day. It’s easy to forget which combinations you’ve used, so keep track of all your bids on a piece of paper or your smartphone. Image: Porto Bay Hotels and Resorts (CC BY 2.0 License). Hey Deia I’ve nominated you for the Liebster Award! Please have a look at my latest blog post here: http://wp.me/pWr3I-d9 Absolutely adore you blog!